"Influence spiritual supplies are worn by those who seek to influence the thoughts or actions of others." Can this also be added to a figure candle or a honey jar to influence another person's actions? 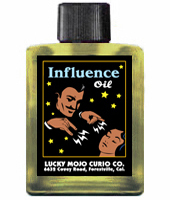 I enjoy using Influence oil. Its another way to get people to listen to you and do what you want. I find it subtler then the Commanding/Compelling/Essence of Bend Over line. I use them on figure candles and dollbabies to get someone to agree to a certain line of thought, favor my case, etc. THANK YOU! You answered what was going to be my next question re: varying degrees of control. I didn't want to put anything overwhelming control-wise in my honey jar. What are the differences and appropriate uses for Influence oil compared to Compelling oil. I read the descriptions and have used Compelling but after reading about Influence, I am thinking it is more appropriate to get a person thinking your way instead of 'compelling' them. Maybe I am on the wrong track. Well, it depends on your relationship to that person and how you want to handle the situation. Obviously Compelling is more coercive than Influence. The ingredients bear that idea out too, being a bit harsher. Humph! That lets me know my thinking...I am thinking that compelling is less coercive than influencing them...thanks cat. I just got my oils today and wondering if I wear the oil or touch anybody I come to contact with with the oil, would I be able to influence their mind and control what their action instantly? I've seen other posts around the forums how I need to burn my dressed candle nightly while thinking about that person but I couldn't find any information on if influence and controlling oil would effect someone instantly by physical contact. Also, I need to say my intention clearly for the oil to work, right? How am I supposed to do that in front of them? Can I just touch them then think about what I want them to think? I'm going to a job interview next week and I want to influence the mind of my interviewer to like me, should I wear the oil on my hand and then shake their hand? For job interviews, I would use Steady Work Products (http://www.luckymojo.com/steadywork.html), however. using the influence products could get the interviewer to listen to you and favor you. I would also dress a purple candle with a written petition under itand burn (at home) during my interview. In addition to wearing a dressed petition in my shoe. Having oil on your hands (just a little goes a long way!) before shaking the hand of the interviewer(s) is a great way. You can prep your hands and say your prayer/intent before you even go in for the interview and as jwmcclin has suggested the Steady Work Products are fantastic for the job and her other suggestions are great to use to reinforce the work. One thing I do invite you to consider when it comes to influencing work for a job is to consider this thought: make sure that you exercise your influence for someone, not on someone. So focus your intent and believe that hiring you will be good for the company. Thank you very much for the suggestion! The interview is tomorrow. I will get some oil on my hand and dab a bit of oil on 4 corners and middle of my resume which I will give to my interviewer as I say my prayer and intention, then shake their hand. I don't have enough time to buy steady work product but I will order it as soon as possible. Hope things will go well. If you are going to apply oil to your resume be very careful because it can and does stain the paper if there is to much on your finger and stains on a resume just isn't appealing for most interviewers. That is why Sachet Powders are so wonderful to use on papers to lay down a sneaky trick. Best of luck on your interview tomorrow! I agree with Papa Newt, sachet powders are much, much better for dressing papers...oil is just too hard to work with on porous surfaces. Excellent suggestions! Quick question- how would we go forward if I just sent my resume for an application to a direct contact through email? This lady has contacted me once through email regarding the requisites for the position. I really want this job in this particular country. Have the details of the position, company and hiring person (name, phone number). I want them to contact me for interview this week and also give me the job I REALLY NEED IT. I would "dust" the resume with Crown Of Success Sachet Powder. Sprinkle some on the resume and draw your fingers through it in a wavy "s" line. Tap the powder off and send the resume away... Much better than having to use oils on paper---as they tend to stain and make the paper look terrible. ..of course, I just re-re-read your post and realize you stated "E-MAIL"! LOL Sorry for the incorrect information then. You could lightly anoint your computer frame around the screen and lightly add some oil to your fingers while you type. Remember a little oil goes a long way---especially when it comes to electronics, etc! I know Cat has mentioned this particular thing a few times and I would take the time to search out previous posts for computer emailing of resumes, etc. Good luck! Sorry for the false info! I'll read more carefully next time! Hopefully much more skilled people (moderators for sure! ... and others) will give you some more great advice for the time after sending it and what can be done! missps2010 wrote: Excellent suggestions! Quick question- how would we go forward if I just sent my resume for an application to a direct contact through email? This lady has contacted me once through email regarding the requisites for the position. I really want this job in this particular country. Have the details of the position, company and hiring person (name, phone number). I want them to contact me for interview this week and also give me the job I REALLY NEED IT. You can burn candles on the person. A purple candle dressed with Influence oil and craved with the persons name and the phrase "Contact Me Hire Me". Burn this on top of an over turned saucer or bowel you place over a petition paper. That paper can take a few different forms but I personally would write out the persons name nine times, turn the paper 90 degrees and cross there name with your command written nine times. Get a bit of Influence oil and maybe some Commanding oil if you have it and touch the four corners and center of the paper with it. Fold the paper towards you. Burn the candle over one week for fifteen minutes at a time while you believe the person is asleep. Dispose of the wax at a cross roads with a prayer that everyone that goes through the cross roads will carry the spell closer to the target. Wear the petition in your show or put it under another candle. Ah, the good old email resume. I do this a bit differently. What I tell clients to do is print out the resume and place it on their altar. Take that physical resume and pray over it, say, "Lord this resume I hold in my hands is now linked in spirit to all that I send." I then tell them to dust the the resume and burn candles on it. As they do that I tell them to pray the 23'rd Psalm. Then dress themselves (I don't like risking oils on a computer), blow their prayers on their hands and send the electronic resume. By keeping a copy of the resume on your altar you are creating a link. Sympathetic magic at its best. I like this idea as well as the computer in my house is common for everyone. Thank you ConjureMan Ali! Hello! I would like to know if I was to use Influence Oil and Crown of Success Oil on two separate candle (not blended)s, what color candles would be appropriate for each oil? Thank you! You could use purple or yellow for either condition and white is appropriate for any spiritual working. I'm really enjoying the new labels! Can you use The above mentioned oils together? Let's say you want the persons mind cleared of all the negative thoughts so you are more easily able to influence there minds. I'm with a guy who keeps wavering between being in a relationship with me or not. I have had readings and was told something is distracting him. I utimately want marriage but each time we get close something happens and it's back to starting over. G'day all, I have recently put an order into LM for some more products, including: Steady Work Kit, 13-day uncrossing Herbal bath Mix, Money Stay with Me Kit and some Chinese Wash. I also have paid for 3 candles to be lit for me via the Missionary Independant Spiritual Church - Steady Work, Money Drawing and Uncrossing. I am trying to obtain a job, but not having much luck with on-line applications. I received the thought of which goods to order from LM by wearing "Clarity Oil" and powder and praying for guidance. I live in Australia, so it will be at least 4 weeks before my amazing products arrive from USA. Meanwhile, I have at home: All Lucky Mojo brand: Crown of Success oil and powder, Influence Oil and Powder, Magnet Powder, Fast Luck Powder, Lodestone Powder, Van Van Powder, Bewitching Oil and Powder, Love Me Powder, Look Me Over powder, Attraction Powder, Steady Work Oil and Powder, Clarity Oil and Powder and King Solomon Oil and Powder. I seem to be getting the vibe that if I wear Influence Oil and Powder along with Steady Work, especially when applying on-line for a job or when just chatting to people, I may end up being more successful in my goal. From what I have read, Influence oil is to be used to influence another's thoughts, but if I apply it to myself to influence others, is that okay in terms of hoodoo tradition? I'm new to all of this, love the LM range of products, love the artwork on the bottles and want to use the correct methodology in my undertakings. I have also recently made a green mojo bag containing Sampson Root, Blue Flag, Gravel Root and Crown of Success oil. Any help from experienced people would be much greatly appreciated. I have learned through the decades to always trust my instincts. It is usually, in almost all cases, spirit speaking to me. Your instincts are correct. Just make sure that when you apply the influence oil, that you state your intention while doing so: "I WILL influence people to do......"
You are definitely on the right track! Thanks Miss Aida. I especially love the artwork and the smell of this oil - I want to wear it all the time!! Can I use this to influence my MIL to be kind to my oldest son (not her grandson) until we move? I've used this with a dream pillow spell & it was really effective. I anointed the petition with it, sewed it into the pillow, then anointed the pillow with it & did the ritual. My husband tells me everytime he talks to me, how sorry he is for the way he's treated his stepson. Also, if I have to lie about something, will this oil help to make people believe me? I have to lie so that my husband & mother don't harass me about the tax money, until me & the kids get the new place. Just wondering if using this before I have to speak with them would be helpful? I used this oil with my husband last night. It was really amazing, he was agreeing with everything I was saying & really understanding that he needs to get away form his mother's control of his life. I'm going to use this today when my MIL comes to pick up her grandson. I was just wondering...could this oil be used used with a name paper petition in the left shoe? I don't have anything stronger, but I really need to keep in control of this situation until I can move forward. I see no reason why you could not use it that way. Seeing this now, lol. I had to experiment last night. Things got CRAZY with my 15 yr.old. He was surly because I had turned off the internet for the night & he texts his g.f. over the wi-fi. Which, she had been texting him NON-stop since he got home from school. He went to bed & my youngest had fallen asleep, so I go out to the living room & smell cigarette smoke!!!! I go in his room to confront him because I've caught him before & he was specifically told that while I may not be able to stop him from smoking, he will NOT be smoking under any roof of mine. So I went into his room & of course he had the audacity to insult my intelligence by LYING to me about it. It must be the "open pack of cigarettes" that I smell???? Uh, yeah, I'm sure it's an unlit cigarette that's making my house smell like a bar, kid!!! That MUST be it. Anyway, it escalated & he punched a hole, in the wall of the house that my monster-in-law owns, grr. So I was at my wits end w/him, ready to get violent, like I just had to walk away. I found a purple candle, spoke my intention into it, carved my intention into it & dressed it while commanding him to "do as I say & be obedient & loyal to me, your mother." I wrote out a name paper & wrote the same command over it, anointing the paper w/ Influence oil. I stuck it under the candle holder, after I taped one of his fingernails to the paper, burned the candle & then folded the paper toward me & taped it shut. It's in my left house shoe now. I've got Bend-Over coming, but that seems harsh to use with my child (even for a teenager). I guess I'll see how this works when he gets home for school. Pray for me! I know about teenage shenanigans. Good Luck to you. Thank you. I will say that this seems to be working pretty well. Influence is very good to use with teenagers. It's like a weapon against the negative influences that try to grasp them at this point. I love that I have this to keep him on the straight & narrow. I hope you don't mind me adding to this, you might like to try Primrose which is in full bloom over here in the UK and might well be where you are. Primrose is used for children to be respectful to their parents wishes and be mindful, you can put the dried leaves and flowers inside their pillow cases or sew them into the seams of their clothes, also Primrose protects the home and keeps unwanted people from entering. I don't mind at all. I hadn't heard that before & if I see any primrose around, I will have to try it out. Off topic, but washing your face with an infusion of primrose in milk (in the evening) is supposed to draw your lover closer to you. I tried that years ago & he did end up moving closer to me, but that's not what I meant when I did it, lol. Should I use influence oil on my reconciliation doll baby? I usually use return to me, reconciliation and love me oils on his hands heart and feet and clarity oil on his head. I was thinking of mixing influence and clarity oil for his head or maybe crown of success. I'm a bit confused. yes, you can use Influence in addition to your other oils. But, not knowing the circumstances, I would be unsure about the Clarity or Crown of Success. I am also working a honey jar using influence oil and crown of success oil that was recommended to me on the forum to influence a family member to be nicer to me and nice about me to other people. This person is using my car tomorrow. Would it be a good idea to lightly rub influence oil on the keys and steering wheel etc? Is there anything else I could do to the car to help my work along? Yes, that's a great idea! You can also use Peace Water, too, if you have it - or Tranquility, Blessing or even Crown of Success like you put in the honey jar. And speaking of sweetness, you can sprinkle a pinch of sugar on the floorboards for him or her to step in. Did you put any other herbs in that honey jar? Add a little to that sugar. I like supplementary spells to "echo" existing work. I took your advice Miss Michaele. I used a cloth and put on a mixture of influence and crown of success oils. I put it on the door handles inside and out, the pedals, steering wheel, the keys, the dash board, the radio controls and seat belt clips. I even lightly brushed the cloth over the seats. I then sprinkled a mixture of sugar, allspice, basil and bay leaves on the floor. I then recited appropriate psalms and said a prayer. As soon as I left the car with him, I went straight home and burned two small purple candles on top of my honey jar, one dressed in influence oil and one dressed in crown of success oil and I read appropriate psalms. Is this your brother? I'm very confused as to why you would let a disrespectful family member use your vehicle? Maybe you should use some Crucible of Courage on yourself to stand up for yourself because it sounds like he's treating you like a doormat & will continue to do so until you set boundaries with him. Even with magic, if he's the type of person that enjoys being a jerk, what incentive does he have to to treat you with common courtesy if you let him use your car, regardless? ETA: I realize this sounds harsh, but I kind of went through the same thing with my soon to be ex-husband. Nothing I did worked. I eventually was forced to set boundaries with him & he chose another woman over me & our children, rather than treat us better. My point is that you can't change the basic nature of people. A person that is basically just an a-hole, will continue to be that way no matter what you throw at them. It is my brother, yes. My car also needed work doing on it and he has his own garage business so he was using it to go to work to do the work. My parents arranged it as he hardly speaks to me. I totally understand what you are saying. Maybe I shouldn't bother with the honey jar and tricks etc. I suppose you're right. I can't change him no matter what I do really. I guess because I really enjoy Hoodoo and it makes me feel like I can do things to help myself when otherwise I'd feel helpless that maybe I'm putting too much faith in it? I'll have a think about it and maybe dispose of the honey jar in the morning. The only strange thing was that he didn't charge me for the work he did on my car and refused any payment that I offered. I am the only member of the family that usually gets charged for the work (to be fair at a fairly low rate in comparison to his customers). I like to think that it's the tricks and the honey jar, as my petition states that I want him to be nicer to me and to say nice things about me, but as the honey jar is only about 2 weeks old I'm not sure. The strange and unbelievable things are still happening and my petition seems to be coming in to effect already. Influence oil and honey jars are great! I also have a honey jar for reconciliation and I was wondering if burning purple candles on top dressed in influence oil for my target would be a good idea or do I need to create a new honey jar and petition for influencing the target? If you are working the target to the same result with both reconciliation and influence, then I think you are fine using the same honey jar. If you are influencing to something different, for example, getting them to repay some money owed and that is different than reconciliation, then you'd want a different jar for that petition. I am completely stunned right now, yet another seemingly to everyone else "out of the blue" and unbelievable thing has happened again and I am completely convinced it's because of my honey jar and influence oil dressed purple candles. I've never ever seen a person change their ways in such a dramatic way or in such a short space of time. I was just wondering if there are any other influence spells that someone could recommend using LM influence products, as I have another target, but I think they will be harder to influence as they are a little bit stubborn and I have no personal concerns of theirs left at all to do a honey jar? If you are not wanting to do more honey jar work on your second target you could work with Skull Candles to influence them. CHeck out this forum for lots of ideas on how to wok those. (skull-candle-questions-and-answers-t15161.html), you can also look at this page for ideas on what to do with Skulls (http://www.luckymojo.com/skull.html) and here is a link to teh skull candles that Lucky Mojo has for sale (http://www.luckymojo.com/products-candle-skull.html). Thank you for your help. I think I'll try something from that section of the forum. Thank you aura. I am definitely going to give some of them a try! The results from this oil have been amazing so far! I forgot to ask, where would be best to dispose of leftover wax etc after this type of work. On my influence honey jar the candles have burned down to nothing at all so far?